Buddy is a very earnest little "love sponge" (as one parishioner dubbed him), and Clem is a happy-go-lucky smiler with a blueberry tongue, who came from the shelter and I think is happy to have this home. Fluffy is a 3-year-old long-haired house cat that I adopted when a parishioner moved into assisted living. I got her in November, and we're growing to at least like, if not yet love, one another. She mostly lives upstairs and is gradually consenting to consort with the dogs. But this post is really about the dogs. I'll get to the cat and my transformation 8 years ago from a cat person to a dog person in another post. At least 3 early mornings a week I run a couple of miles with my dogs. Well, I call it my "old lady run:" I run down the hills and as far up as I can get, then I walk mostly uphill. But it's enough to get my endorphins going, and to give them a nice 40-minute exercise period in the morning. I try to be out of the house by 7, and back home before 8. In the summer (I can feel the season shifting) I tend to wake up by 6, and them am home before 7. It gets too hot here in the summer to be running after 7 or so. The picture above is the large field behind our church, and adjacent to my own back yard. 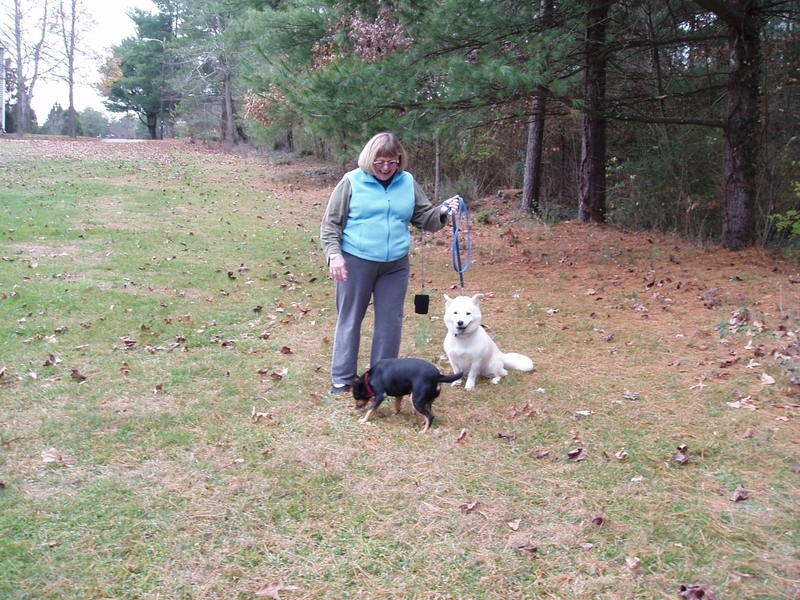 This picture was taken in December; the ground is now covered with lush, green grass that grows VERY fast. I hope to put a labyrinth back in this field/parking lot this year; I've wanted one since I came here 5 years ago, and nobody jumped on the prospect. If I want it, I'm just going to have to DO it. I hear Eagle Scouts can be convinced to take on many such projects, so I'm looking for one (an Eagle Scout in need of a project, that is). Anyway, this is NOT the direction I run. I go west across "front yards" (houses are usually set far back from the highway here, so we're actually at least a dozen yards, and often hundreds, from the houses themselves) until I get to Kings Row, then I run through the Kingsgate subdivision, back to the Riverchase subdivision. There's not much traffic there, but every time a car passes, I wave, and the drivers wave back, and I've made some acquaintances that way. It feels like "neighborhood" to me. A parishioner who lives in that subdivision says that people talk about me when they haven't seen me in a while, and ask if I'm ok. There is a fence here, and the dogs have gone inside the fence, while I stand outside. That red line is Bud's leash. One thing I love about little dogs is that they just work through their fear and never show it. Here's little Bud, who's about the size of a small Jack Russell, barking like crazy at those curious cows, and one has even turned around to flee. The others are keeping their distance. I was impressed with his bravery, though I really wanted him to try to make friends with them. See that white thing at the bottom of the picture? 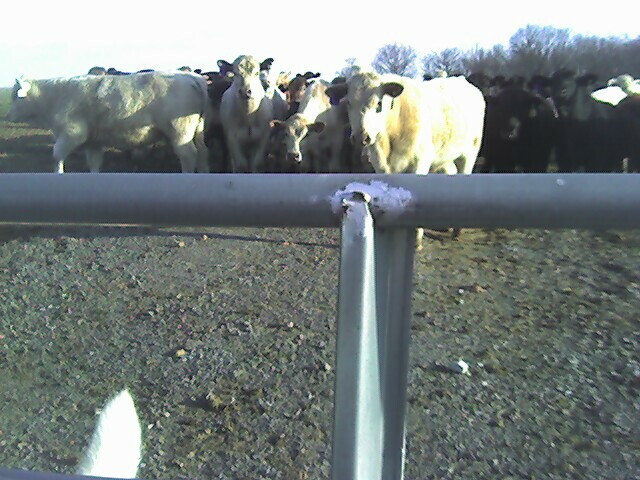 That's Clem's tail as she literally "turns tail" when the cows begin to be interested in meeting her. 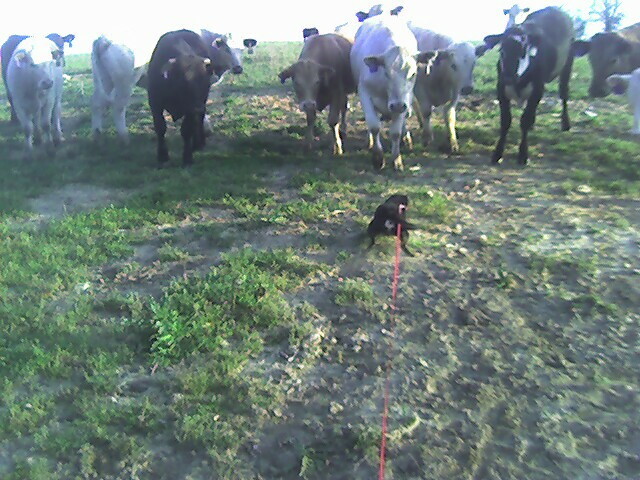 Maybe she'll get there one of these days, but today was not the day she wanted to "meet the cows." It's interesting that I love the large gentleness of cows, and yet I don't have a qualm about eating beef (yum). But pigs -- I've heard they're smarter than dogs, smart as a 3-year-old human. I went through a time when I simply could not eat pork. I've backed off that stance a bit (have some ham cold cuts in my fridge this very moment), but still -- it does give me qualms to eat pig. Someone told me once that pigs would become feral after a very short time outside confinement -- but for me, that only PROVES that they are smart -- if you escaped from a pig farm, would you want to be wild and free, or calmly go back to the pig farm? I know what I'd choose! Anyhow, it was the first thing this morning that started making my day extraordinary (though I know that any day I run will be an outstanding day -- it's those endorphins, I'm telling you). I got to write my morning pages outside, seranaded by cardinals, honeybees, and finally (because the traffic noise was annoying me) my big fountain that I made last year (I'll take a picture another day -- it's too dark now). It's amazing how that simple fountain (pump, pipe, big resin flower pot from Wal-Mart, water) can mask the sound of the traffic on my back porch, and it only took me 10 minutes to set up, having been dismantled for the winter.